For more than five years I’ve been predicting that brands would shift their attention from social media marketing to social customer service and online customer experience. And according to new research from Altimeter Group, that threshold has now been crossed. 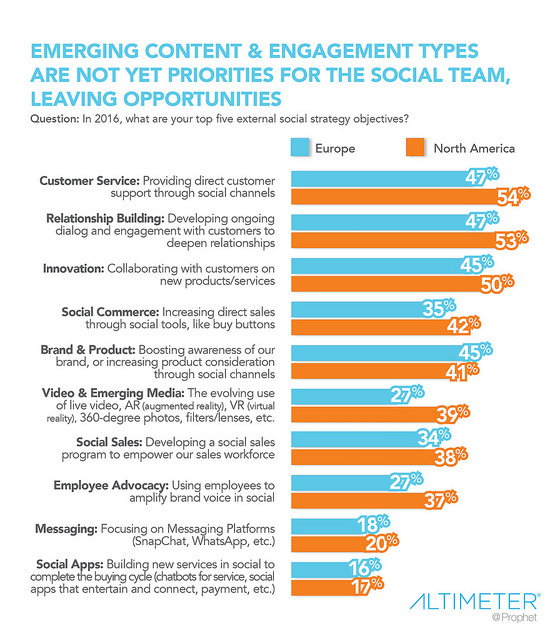 In their “2016 State of Social Business” publication, Altimeter analysts Ed Terpening and Aubrey Littleton report that among 523 respondents in big companies in the US and Europe “social customer service” is now the top external objective for social business functions, just ahead of “relationship building” – which also focused on current customers, not customer acquisition. Simply put, social has always been better for loyalty and advocacy than it’s been for creating new customers out of thin air, and the social business industry has finally either awoken to this fact, and/or is now willing to admit it. This shift toward social customer service has many implications, including new ways to measure the success of overall social efforts. For example, if customer loyalty and advocacy are the core objectives, does measuring “engagement” still matter? Also, does the social media team report to a different part of the organization once social customer service becomes a priority? And, how does the social media team integrate with personnel that provide customer service and relationship building via more traditional methods such as telephone and email? Some of these topics I explored in my book Hug Your Haters, and nearly every company will have to make these types of decisions in the near future. 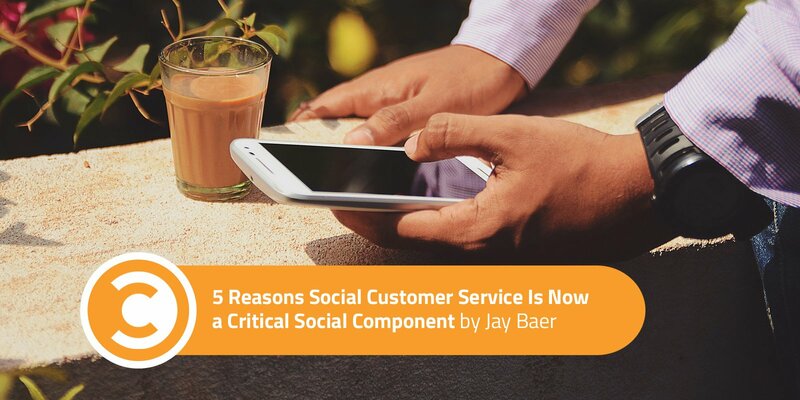 The same way customers demanded brands build websites and respond to emails, they are now demanding that companies allow for social customer service. For customers, interacting with brands via Twitter, Facebook, Instagram, Messenger, WhatsApp et al is often faster and easier, and many customers believe they receive better care via these channels than they receive via phone and email. According to a new report from Conversocial, 54% of customers prefer customer service via social media and SMS. For their part, Twitter and Facebook have rolled out several tweaks and enhancements to their platforms to make them even more viable replacements for traditional contact channels. The social customer service genie is not going back in the bottle any time soon, and more and more customer contacts will occur on these platforms. Consequently, an increasing percentage of customer interactions are playing out in full (or at least partial) view of the public, making customer service a spectator sport for the first time. For millennia, most customer contacts have taken place in private. But not now. And when other current customers (and prospects) can see precisely how a business handles questions and negativity, that disposition can have a material impact on revenue. Historically, there was no real upside to being great at service, and no real downside to being terrible at service. Now, in the spectator sport era, the positives and negatives of social customer service are amplified geometrically. A brand can have the best marketing in the category but if the opinions of actual customers do not jive with the company’s positioning, that marketing is a colossal waste of money. Marketing builds awareness and creates demand, but cannot succeed without strong customer experience and a solid reputation to back it up. How often have you been reached with a marketing message and took action, only to stop dead in your tracks after seeing less than glowing customer reviews? This happens most often in localized search, when you find a potential restaurant or retailer (search marketing at work) but then do not click through to a landing page because the restaurant has average ratings of 3.2 (customer experience preventing marketing from doing its job). Customer experience is all about expectation management, and one of the best ways to exceed customer expectations right now is with stellar social customer service (as demonstrated in Hug Your Haters). Companies that want their marketing to work optimally must think holistically about awareness building, customer experience, and post-sale customer service in every channel. Organic reach on Facebook, Twitter, and Instagram is shrinking like my tolerance for Tom Brady’s smugness. Every experienced social media manager knows that the ability to reliably reach “fans” for “free” on these platforms is difficult at best. So the few people that are reached organically are even more likely to be current customers, advocates, and super fans. That is, they are the small minority of the overall audience that interacts with a brand’s content so consistently that the algorithmic overlords still show this micro-segment brand posts in the feed. Both are important, but when it comes to free, organic social just understand that it is about current customers, not new ones. Studies vary greatly on the precise costs per channel, but we can agree I’m certain that it is less expensive to interact with a customer in social media than it is via phone or email. Further, not only are their cost savings inherent in shifting more customer service to social, the impact on customers is significant because their expectations are quite low at this point. In the research for Hug Your Haters (conducted by Edison Research) we found that customers are more likely to advocate on behalf of brands who answer their complaints. But, the increase in advocacy varies considerably by channel. When a company answers a customer complaint via email, it increases advocacy by an average of 8%. When a company answers a customer complaint via social media, in increases advocacy by an average of 20%. The entire reason and rationale for social media is shifting from pre-sale marketing to post-sale customer experience. This requires a fundamental reassessment of goals, objectives, tactics, personnel, tools, and metrics. We’ll be writing more about this at ConvinceAndConvert.com, and our consulting team is already working with several major brands to help pilot this shift. We’d love to help you, as well.